HealthCare.gov's Sign-Up For 2018 Health Insurance Ends Friday For Most : Shots - Health News A shorter enrollment period and big cuts in the federal budget for outreach are taking a toll, say those helping with health insurance sign-ups. Deadlines for most state exchanges are a little later. 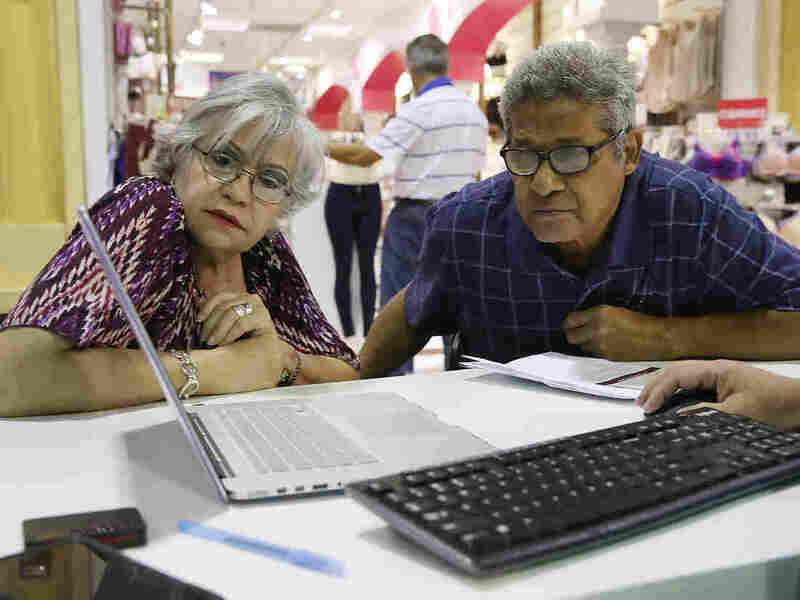 Isabel Diaz Tinoco and Jose Luis Tinoco had some questions for the Miami insurance agent who helped guide them in signing up for a HealthCare.gov policy at the Mall of the Americas in November. He is the president of a church-sponsored job training center called Salvation Academy. But this time of year, he acts mostly as an enrollment counselor for Affordable Care Act health plans. And this week, his calendar is full. "Every year when you get close to the end, that's when you have a lot of people come in," he says. Deen has stopped allowing people to stand in line outside his office and instead now requires them to make an appointment. That way, he says, he can give them his full attention, rather than being distracted by impatient people waiting. As we sit to talk, a client calls with an update. The man had been rejected by the HealthCare.gov system because of issues with his email. He tells Deen that his son has helped him resolve the problem. "Yesterday I have a client and she has difficulty in choosing a plan based on her tax credits and her qualifications," Deen says. "She has this bunch of plans — there's silver, there's gold, and she's just confused." As of Sunday, about 4.7 million people had enrolled in a health plan and more than a million of them were new customers. That's about 650,000 more than signed up in the first six weeks of last year, according to Lori Lodes, who ran outreach for HealthCare.gov during the Obama administration and is now leading an effort called Get America Covered. "We are seeing record demand," Lodes says. "People want to get health coverage, and people are finding affordable coverage when they actually shop and sign up." "The problem is that the enrollment period is cut in half," she adds. Friday is the deadline, at least for people buying insurance through the federal marketplace. Several states run their own exchanges and those enrollment periods usually last longer. The Department of Health and Human Services earlier this year cut the enrollment period, arguing that the shortened period would likely reduce the number of people who buy insurance only when they get sick. And the agency also cut the budget for outreach and advertising for HealthCare.gov by 90 percent. Trump administration officials declined requests for an interview on this year's changes to enrollment. But a spokesman says the HealthCare.gov website and call centers are working smoothly and handling the final week's volume. Lodes' group has been enlisting big names to help drum up awareness, including a YouTube video featuring West Wing actors Martin Sheen and Bradley Whitford. "We are both here to remind you about the Affordable Care Act," they say. "And here's what you need to know. You gotta sign up!" Former President Barack Obama has been on Twitter reminding people to enroll. "It's up to all of use to spread the word. Sign up through this Friday," he tweeted. And earlier this week, comedian Jimmy Kimmel gave HealthCare.gov a plug on his show. "Obamacare is not dead," he said, while holding his son, who recently underwent surgery, on his hip. "It's very much alive. Millions of people qualify for a reduced rate or even totally free plans."